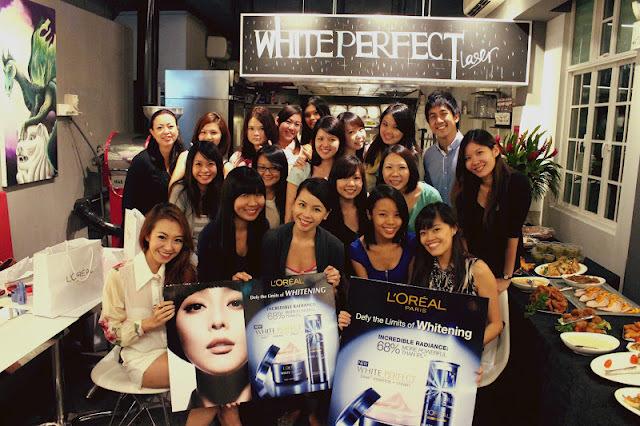 Saturday, May 26, 2012 :: Review for L'Oreal White Perfect Laser! 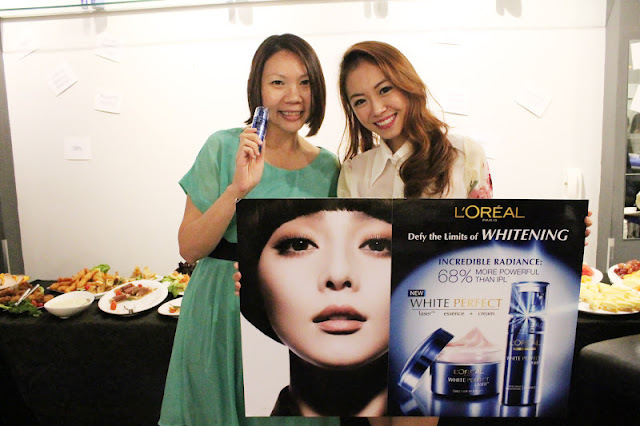 I have been on a 14-day regime to test out the efficacy of L'Oreal's White Perfect Laser range after an invitation from Loreal to its launch event. The selling point of this product claimed that "100% of the women who used this white perfect laser combo for 8 days would delay their planned IPL session" due to the effectiveness of this product range. Now that really got my attention. I was pretty intrigued during the hour long presentation on the effectiveness of this product range so I decided to stay on a strict 14-day regime to test out the products. I hope that this 14-day regime test is sufficient for me to give a honest review on these products! To do so, I actually stopped using my usual skincare regime which includes products from Laneige, Curel and SK2. The first step is to apply the anti spot brightening essence (tall bottle on the right). This product is known to lighten dark spots. I used to have pigmentation on my cheeks which gave me a natural flush (all for the wrong reasons) when I go bare-faced. It started to surface when I was around 15-16 years old. I realized that upon starting a course of supplements from Sato Hakubi, my pigmentation actually started fading away. I do not know if I can credit these Loreal products for the disappearance for my pigmentation as at the end of my 14-day test due to the interference from my oral supplements. However, my skin became visibly fairer and my pigmentation is close to 100% gone. A visible result which I definitely see in the day (upon my first application in the morning after cleansing and toning) is a fairer and radiant complexion. The skin on my face is thoroughly moisturized and it appears dewy-looking - an end effect I like when I use my Chanel Vitalumiere liquid foundation. This is the all round protection whitening cream which is slightly pinkish in color. I like that it contains SPF19 PA+++ as it provides powerful protection against the UV rays. I am not one who likes to apply sunscreen so I especially love products which provide UV protection. I attribute the result of smoother skin, increased radiance and less visible pores to this magical product. I believe that with continued use, the condition of my face will definitely improve. During the presentation, it was mentioned to us that it is recommended to use both products together as clinical trials of this range (tested on Asian women who were preparing to do IPL) made the test subjects use both products together. Tests were not done separately on each product. So I believe that both products actually compliment each other to a large extent! 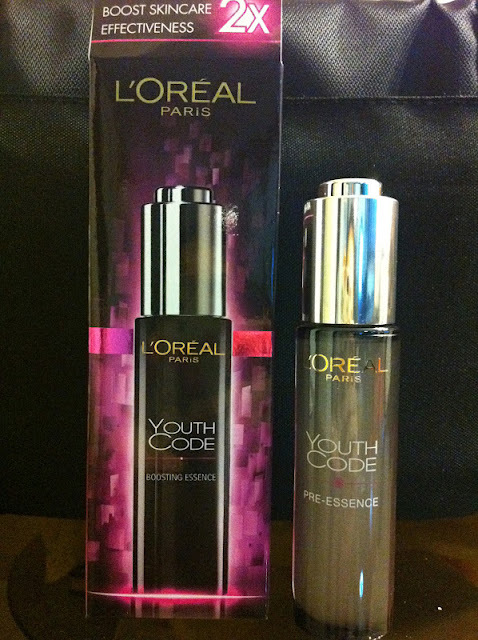 I was also given Youth Code Pre Essence and the people at L'Oreal seemed really confident about this product. Have you used it yet? Please let me know if you had! Heard many people raving about this product at the event so I am going to start another 14 day regime on this product before giving my review.